He was my photography guide that day, driving me around for a couple hours finding me different spots to photograph. December had a few days where it was nothing but dense fog and frost. It really did look a bit blue outside. And a really cool phenomenon called "hoar frost" was hanging around, making everything look like a winter wonderland. 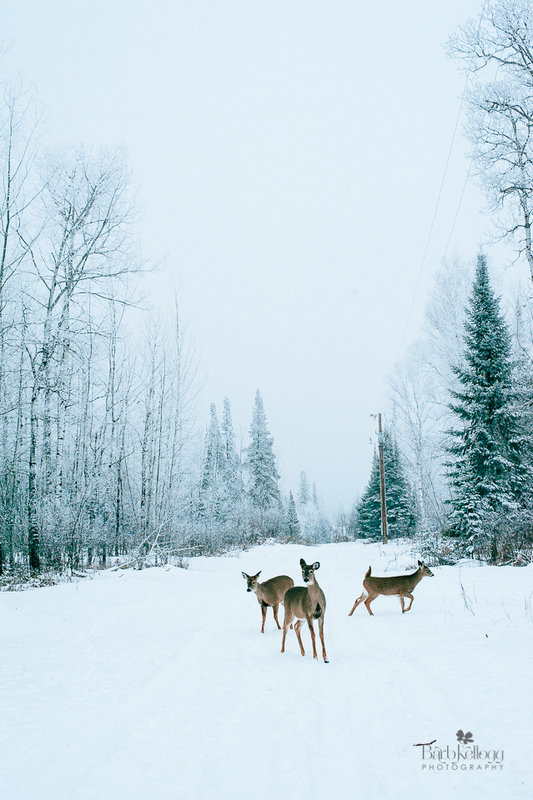 In mid-December Dad and I were driving through a campground, and we spotted some deer. So just that was kind of cool, but then I decided to be bold and get out of the car and see how close I could get. I only had my 50mm lens on my camera, which approximates how you see with your naked eye. That should give you some idea of how close I really was. The first image above gives you some reference as to the distance I slowly walked, shooting a shot with each step, never knowing when the deer would get spooked and scamper away. The closer I got, the more excited I was getting! I had to stop and think " just breathe". I also remembered to take my camera away from my eye and just take in the moment. I don't think I've even been this close to deer in a zoo, so this was a cool moment. For a few minutes I was thinking I was quite the deer whisperer. The funniest moment was when I thought I was done photographing and walked away from the deer. I then hear my dad yelling from the car "they're following you!" But then a person walking by told me that people who live near the campground feed the deer, so they seem to feel pretty safe in this protected area and were somewhat comfortable with people. I'm guessing those deer were thinking I might have some treats for them. Ha, no different from my dog following me when he thinks I might have a treat. I've got some more images from this same afternoon to share with you for the next blog post. The hoar frost was simply amazingly beautiful. I even got my dad to pose in one of the photos.